Get in touch with nature at Alcatraz Island and Fishing Charters & Tours. There's still lots to do: take a leisurely stroll along Fisherman's Wharf, snap pictures at Golden Gate Bridge, take a stroll through SoMa, and appreciate the extensive heritage of The Embarcadero. To find ratings, where to stay, photos, and other tourist information, refer to the San Francisco sightseeing planner. Prague, Czech Republic to San Francisco is an approximately 16.5-hour flight. You can also do a combination of train and flight. The time zone changes from Central European Time to Pacific Standard Time, which is usually a -9 hour difference. Traveling from Prague in April, expect San Francisco to be a bit warmer, temps between 22°C and 12°C. Finish your sightseeing early on the 4th (Thu) so you can drive to Carmel. Carmel-by-the-Sea, often simply called Carmel, is a city in Monterey County, California, United States, founded in 1902 and incorporated on October 31, 1916. 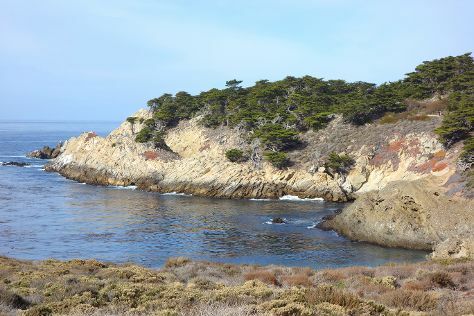 Start off your visit on the 5th (Fri): admire the majestic nature at Asilomar State Beach and then immerse yourself in nature at Point Lobos. To find photos, more things to do, where to stay, and more tourist information, read Carmel attractions tool . Drive from San Francisco to Carmel in 2.5 hours. Alternatively, you can fly; or take a bus. April in Carmel sees daily highs of 20°C and lows of 10°C at night. Finish your sightseeing early on the 5th (Fri) so you can drive to Yosemite National Park. Visiting Cathedral Beach Picnic Area and Fishing Charters & Tours will get you outdoors. Spend the 9th (Tue) exploring nature at Elizabeth Lake, Yosemite National Park. Next up on the itinerary: trek along North Dome, identify plant and animal life at Nature Center at Happy Isles, tour the pleasant surroundings at Mono Pass Trail, and take in the dramatic natural features at Glacier Point. 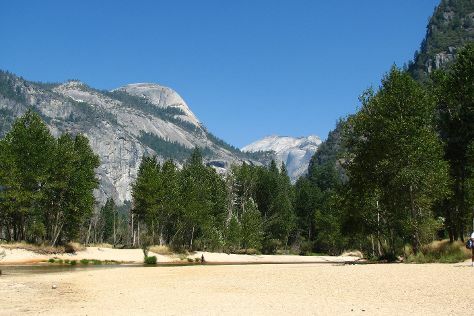 For where to stay, maps, traveler tips, and other tourist information, you can read our Yosemite National Park online vacation planner . Drive from Carmel to Yosemite National Park in 5 hours. Alternatively, you can do a combination of flight and car; or do a combination of shuttle, flight, and car. Traveling from Carmel in April, you will find days in Yosemite National Park are slightly colder (17°C), and nights are much colder (-2°C). 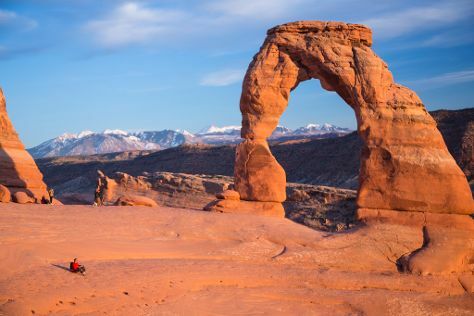 Cap off your sightseeing on the 10th (Wed) early enough to travel to Moab. Kick off your visit on the 11th (Thu): take in the awesome beauty at Arches National Park. To see traveler tips, maps, other places to visit, and tourist information, read Moab trip planner. You can do a combination of car and flight from Yosemite National Park to Moab in 9 hours. Alternatively, you can do a combination of car and flight. You'll lose 1 hour traveling from Yosemite National Park to Moab due to the time zone difference. Plan for a bit warmer temperatures traveling from Yosemite National Park in April, with highs in Moab at 22°C and lows at 3°C. Cap off your sightseeing on the 11th (Thu) early enough to go by car to Grand Canyon National Park. Take a break from the city and head to Grand Canyon South Rim and Rim Trail. On the 14th (Sun), hike the day away at Bright Angel Trail. Next up on the itinerary: take in a show at Hopi House, get great views at Grandview Point, don't miss a visit to Grand Canyon Village, and tour the pleasant surroundings at South Kaibab Trail. To find other places to visit, photos, and other tourist information, refer to the Grand Canyon National Park attractions planner . Getting from Moab to Grand Canyon National Park by car takes about 5.5 hours. Plan for a bit cooler temperatures traveling from Moab in April, with highs in Grand Canyon National Park at 19°C and lows at -3°C. Finish your sightseeing early on the 16th (Tue) so you can travel to Las Vegas. Las Vegas is known for nightlife, shopping, casinos, historic sites, and nature. 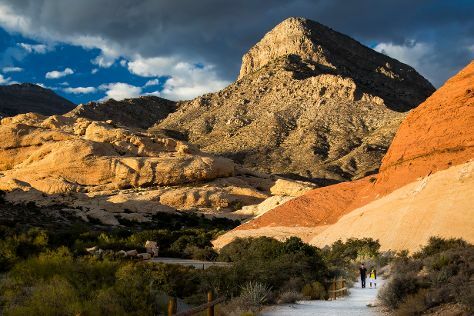 Your plan includes some of its best attractions: take in breathtaking views at Red Rock Canyon National Conservation Area, try to win big at Caesars Palace, see a show at Casino at the MGM Grand, and get a taste of local nightlife at Double Down Saloon. To see photos, reviews, other places to visit, and tourist information, read Las Vegas holiday planner . Getting from Grand Canyon National Park to Las Vegas by combination of flight and car takes about 4.5 hours. Other options: drive; or take a shuttle. You'll gain 1 hour traveling from Grand Canyon National Park to Las Vegas due to the time zone difference. When traveling from Grand Canyon National Park in April, plan for a bit warmer days in Las Vegas, with highs around 31°C, while nights are warmer with lows around 16°C. Finish your sightseeing early on the 19th (Fri) so you can travel to San Diego. Start off your visit on the 20th (Sat): kick back and relax at Black's Beach, look for all kinds of wild species at Torrey Pines State Natural Reserve, and then sample the fine beverages at Malahat Spirits. On your second day here, look for all kinds of wild species at Lions, Tigers & Bears and then enjoy the sand and surf at La Jolla Cove. To find photos, ratings, reviews, and other tourist information, refer to the San Diego online tour planner . Traveling by flight from Las Vegas to San Diego takes 3.5 hours. Alternatively, you can drive; or take a bus. Traveling from Las Vegas in April, you will find days in San Diego are little chillier (25°C), and nights are about the same (17°C). Finish your sightseeing early on the 21st (Sun) to allow enough time to travel back home.